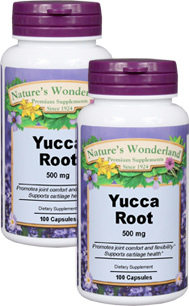 Yucca - 500 mg, 100 capsules each (Nature's Wonderland) - Penn Herb Co. Ltd. If you're experiencing limited mobility, get moving again with Yucca, a natural, safe, effective solution. It's a plant source of the bone-supporting nutrients Calcium and Phosphorous, plus the cartilage-nourishing minerals Silica and Manganese. This desert plant has long been a part of the culture of the Hopi, Navajo, Walapai, and other native tribes living in the Southwest. Yucca remains an important herb in American herbalism for joint flexibility and comfort. Nature's Wonderland Yucca is guaranteed for purity, freshness and labeled potency. Traditional blood purifier; digestive aid.